This site was started July, 2013 and is under construction. 20 years ago if a patient had MS and they were looking for some type of a cure there wasn't the type of hope that there is today. These areas are evolving so rapidly that the medical community is having a hard time keeping up. Although I've said that MS is one of the success stories, one of the problems that we have is that there's so many advances that are coming so rapidly that many healthcare providers that are involved with MS patients have a hard time processing all of the information. There is a huge number of patients and over 10,000 patient's papers a year written on multiple sclerosis. So, one of our challenges at the Rocky Mountains MS Center is to help disseminate this information in a usable way, and one of the issues that is really trying to change their thinking about what the goal of treatment of MS is. first time in history that's been the issue. So the implication of that though is how do we get that information out so that all of the patients and physicians in the area can use best practices to really minimize the risk of disability for patients in the future. And that remains a real challenge for us. We have strong educational programs for patients and it's a little bit harder for us to communicate with all of the healthcare systems and help them understand the new therapies. Particularly from the standpoint that within the next 12 months we are likely to have three new therapies that have very novel mechanisms of action and require a really major education program and part of healthcare professionals to understand how best to use them. challenges at the Rocky Mountains MS Center is to help disseminate this information in a usable way and one of the issues that is really trying to change their thinking about what the goal of treatment of MS is. ALL NEUROLOGISTS SHOULD BE "INDUCING FULL REMISSION" AND NOT JUST "SLOWING MS DOWN"
On the eve of a major MS meeting, the European Committee for Treatment and Research in Multiple Sclerosis (ECTRIMS) Congress, taking place next week in Copenhagen, Denmark, Medscape Medical News asked several MS experts to give their views on this question, as well as how they use the various different agents that are currently available. Another expert who believes in the "hit it hard early" strategy is Timothy Vollmer, MD, University of Colorado School of Medicine, Denver. "The therapeutic goals are changing," he told Medscape Medical News. "We are moving from slowing the disease down to inducing full remission." Dr. Vollmer points out that most disease activity is subclinical. "Physicians can't tell by looking a patient what is happening in their brain. Even an MRI once a year is inadequate. You need high-resolution 3D volumetric scans to see brain atrophy. This is not routinely done. If we allow the management to be governed by symptoms we are trading off function in later life. The goal should be to preserve function now so as to reduce lifelong disability. Disability has been correlated with reduced brain volume on MRI, so we can rank the drugs on their effect on inflammation and brain atrophy. "The trouble with keeping the powerful drugs for advanced disease is that you need some brain reserve left to show improvement. That is why I think we need to treat early to maximize benefit with these drugs," Dr. Vollmer said. "In appropriately selected patients they can be just as safe as interferons, but much more effective." "We are more aggressive at our center, but we are using the data as it has been published to make decisions," he adds. "I think this is the way it will go in the future. Other experts worldwide think similarly. However, the vast majority of general neurologists are not at this level. We are in the relatively unusual position of having been involved in all the studies. I've seen all the data at investigator meetings — more than that which has been published — so I have more confidence than most." This educational activity based on a recent live symposium held in conjunction with the Fifth Cooperative Meeting of the Consortium of MS Centers (CMSC) and the Americas Committee for Treatment and Research in MS (ACTRIMS) is designed to increase the knowledge and competence of neurologists with respect to the management of multiple sclerosis. In this activity, Dr. Timothy Vollmer and Dr. John Corboy will discuss several interesting areas related to the management of MS including recent data on available and emerging disease-modifying therapies and the current status of predictive and prognostic biomarkers for patients with this disease. They will also discuss the science behind the comprehensive treatment of MS. 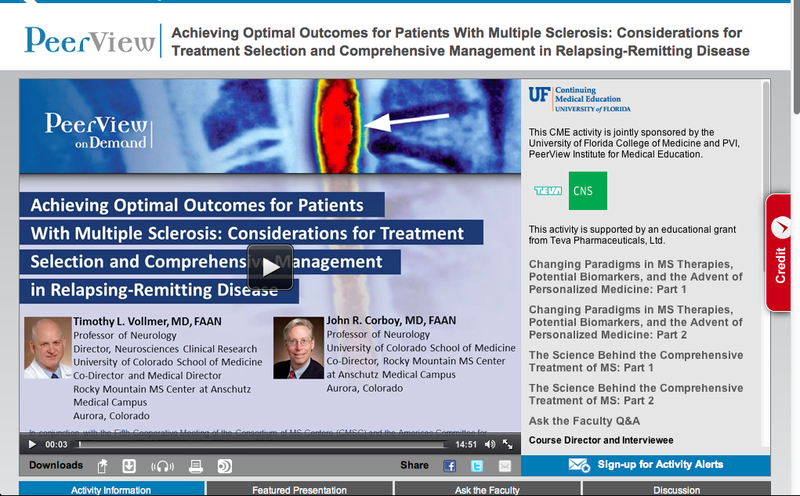 The goal of treatment with disease modifying agents in MS is evolving. More and more we are aiming to put patients into a disease activity free state. In other words, we are trying to maximize the probability that a patient will not have relapses, will not have progression of disability and will not have new lesions on their MRI. This would be the disease free state. If they have not achieved that on a first line therapy then they should be considering the newer agents such as tysabri and gilenya. To make the decision as to which to consider, they should be tested for antibodies to the JC virus that causes PML. If they don’t have antibodies to this virus then tysabri has the best risk/benefit ratio and should be considered. However, if they have failed tysabri or do have antibodies to the JC virus, then gilenya would be the appropriate choice. The challenge with gilenya is that the the full safety profile is still somewhat uncertain. So patients treated with this medication need to be followed closely and need to understand that our assessment of risk of this agent may change as we get more experience with the agent. But gilenya is approved as a first line agent and, in general, the large majority of patients do quite well on the drug. In our experience, a few patients have had troubling diarrhea on the drug and few felt they had more MS fatigue on gilenya then they had on tysabri. But over 90% of our patients have told me they feel well on the medication and are doing well. There is a modest suppression of the immune system which does manifest as a small increased risk of infection and this is another reason patients need to be followed closely. But in reality I have not had more trouble with gilenya than I have had with interferons. The major remaining questions relate to if the drug has a risk of life threatening infection, cardiac or cancer, particularly skin cancer. If present they would obviously be relatively rare. But we don’t currently have enough data either way to rule in or out these possibilities which is the purpose of ongoing safety studies. But this is a problem for many widely used drugs. Gilenya is often considered a second line drug in practice but that is mostly due to the fact many insurance companies require patients to have failed the other agents because of its cost. The issue's that we probably don't need to know exactly, what it is that causes the disease in the first place. What we need to know is how to reprogram the immune system so that we can stop the immune attack on the brain. The immune system is actually the other organ in the body that learns from experience. immune attack on the brain. That's our best hope I think at this point for finding a true cure. years. Shortly after Dr. Augusto Miravalle joined us and then Dr. Matthew West and now Dr. Terry Shriner will be joining us in July. We're also having a recruitment process for another physician and we have Melissa Butler and Christie Swim who are our mid-level providers and as result the program has gone from a few hundred patient visits per year to about 6000 patient visits per year for multiple sclerosis alone. the Canadian border down to New Mexico. is moving very rapidly to develop new strategies for treatment and I think better strategies. clinical work to identify the key questions in a laboratory that are most likely going to result in improvements in treatment in the near future. So we are now one of the largest programs in the world and still growing. There have been recent advancements in the treatment of MS. Multiple sclerosis is one of the success stories in medicine today. Since 1993 we have actually have had a bear please approved by the FDA to try to prevent progress and disability in multiple sclerosis. We have three more that are currently [April 2012] being reviewed by the FDA and could be approved within the next year. For the first time in history the field now has several ongoing clinical trials in humans using therapy to try and repair the nervous system. These initially were focused primarily on stem cells of various types and Dr. Corboy here is using a study using umbilical vein stem cells as a reparative strategy. However recently we also have become where there are other strategies that might work. For example there was an antibody called anti-lingo that is being studied and that's anti-body helps turn off the signals in the brain that prevents the repair process. So it allows the brain's own repair process to become more active. There are other such strategies in the future including actually exercise which we now think about as a reparative therapy. We're much better preventing the progression of the disease not then we are reversing or repairing the nervous system. And some of the newer therapies are particularly effective and so in patients that can use these newer therapies, they actually have a very high chance that they will not develop significant disability over their lifetime with the modern therapies available today. It turns out that the amount of disability that a patient has is not determined just by the MS activity, but also by other factors. For example if they develop hypertension or diabetes or obesity, that substantially increases the amount of disability they will have from MS. So one aspect is maintaining a good activity program and a diet to try and prevent secondary diseases from occurring or what we call co morbidities. reserve function that the brain uses to mask the underlying damage that's occurring in the nervous system. So diet and exercise are just as important as the drugs that we used to try and prevent inflammation in the brain.
. THE PREVALENCE OF MULTIPLE SCLEROSIS IN THE U.S. The number of people, in the United States, is a difficult number to get at. Early estimates estimated around 400,000. More recent estimates are approaching 800,000 to almost 1,000,000 people in the United States. The disease is highest in northern European countries and part of the reason why we have such a high frequency across Colorado has to do with migration patterns that occurred back in the 1800s and early 1900s that led to a large number of northern Europeans including Swedes, Germans, Scott, Irish moving into this area. "This is a very important point. We typically think of MS as a disease of young adults that then runs its course over the rest of their lifetime. But in fact they can occur at any age. We have seen children as young as a year and a half of age develop multiple sclerosis and I've also seen individuals that in their 70's they have their first presentation of multiple sclerosis." The unfortunate thing is that in the children form of the disease it has been missed or misdiagnosed, frequently, over the past century in part because of technical issues, but also in part because there was a reluctance on the part of the medical community to label a child with a disease that, up until recently, was considered almost certainly associated with high levels of disability. Now, though, because we have therapies available it's very important for us to pick up children very early in the disease course because we can treat them and we're getting better at really preventing them from developing significant disability." It's an inflammatory disease where the immune system attacks the brain and a volatile repetitive fashion so patients will accumulate lesions over time and these will randomly hit the nervous system including the brain, the optic nerves and the spinal cord. The most common symptom of MS is actually fatigue and the second most common is depression and then after that it's cognitive problems with memory and motor skills. Then sensory problems, motor problems, pain, bladder problems et cetera. It can affect essentially anything that the brain does. “Tecfidera represents the second oral treatment [the first being Gilenya] that is more effective than current first-line medications and has a good safety profile,” said Dr. Timothy Vollmer, Medical Director of the Rocky Mountain MS Center. “Side effects from Tecfidera were relatively mild and only lasted for a couple of weeks." BG-12, an oral treatment for relapsing-remitting forms of multiple sclerosis, has received FDA approval and will be sold under the name Tecfidera. Manufactured by Biogen Idec, it becomes the third oral disease-modifying medication available to treat MS. Others include fingolimod (Gilenya) and teriflunomide (Aubagio). Tecfidera has been clinically proven to reduce relapses and development of brain lesions, and appears to slow disability progression over time. It also has an encouraging safety profile and is well-tolerated by patients. Tecfidera appears to have dual anti-inflammatory and neuroprotective effects, which may represent a new class in treatment for MS. It has been shown to activate the Nrf2 transcriptional pathway. This pathway is thought to defend against oxidative-stress induced neuronal death, protect the blood-brain barrier, and support maintenance of myelin integrity in the central nervous system—all key elements to treating MS.
Tecfidera has been used for many years in Europe and elsewhere to treat psoriasis. Phase III clinical trials of Tecfidera include the DEFINE and CONFIRM studies, which combined, enrolled more than 2,600 patients. For more detailed information about these studies CLICK HERE. The most common side effects associated with Tecfidera were flushing and gastrointestinal (GI) events (i.e., diarrhea, nausea and abdominal pain) and occurred in up to 60% of patients but were generally mild and generally resolved with in a few weeks. In some patients, average lymphocyte counts decreased during the first year of treatment and then remained stable. The incidence of infections and serious infections was similar in Tecfidera-treated patients and those on placebo. Patients taking Tecfidera should have a complete blood count (CBC) before starting treatment and a follow-up CBC annually. There are over 60,000 MS patients on Gilenya world wide. There have been other cases of PML in patients started on Gilenya, but in all cases until this one it was in patients that had just stopped Tysabri, and the PML was felt to be due to the Tysabri, not the Gilenya. This case is different in that the patient was never on Tysabri. But the patient was exposed to high dose steroids repeatedly and, briefly, to azathioprine, both known causes of PML. Also, the clinical characteristics of the disease in this patient is quite unusual in MS. So, the bottom line is that we must wait for more information on this case and continue to monitor safety reports world wide on Gilenya along with all the other new meds. I do not think patients should be stopping Gilenya to start other therapies because, of the newer more highly effective therapies, there are none that are clearly safer than Gilenya at this time. This may change in the future, but even if this case of PML is directly due to the use of Gilenya, we need to consider how best to approach the issue and this will take a few more months as the MS neurologists around the world discuss this case. Next month, we have a large international meeting on MS in Copenhagen. I would suggest patients on Gilenya wait for that meeting to end before consulting their doctors about changing their MS therapy. I will start writing Part 2 for my column 'The PML case on Gilenya" for your MSnewsChannel.com after my international meeting on MS in Copenhagen next month. Thanks for everything. Feel free to call any time. PML can present in many ways so any new neurological symptoms in patients on natalizumab should be evaluated by an experienced neurologist. But often the earliest symptoms are cognitive and can consist of word finding difficulty, memory dysfunction, confusion, followed by gait ataxia, vision problems, etc. Even though a patient is JCV antibody negative, he should still be evaluated for PML if any new symptoms or worsening of old symptoms. We must remain vigilant. Particularly now that treatments are also improving for PML. Background: Sexual dysfunction is common in multiple sclerosis (MS) but reliable and valid measurement in this population is needed. Objective: The objective of this research is to re-validate the Multiple Sclerosis Intimacy and Sexuality Questionnaire-19 in a large US sample. oblique rotation with Kaiser Normalization validated its construct validity. Conclusion: The revised 15-item MSISQ is a reliable and valid measure of sexual dysfunction in men and women with MS.
Dr. Vollmer sub-specializes in multiple sclerosis. He has a special interest in immunotherapies for MS. Dr. Vollmer is Medical Director of the Rocky Mountain Multiple Sclerosis Center, and Co-Director of the RMMSC at Anschutz, which provides a multidisciplinary approach to treatment of this disease. He sees patient at the Anschutz Centers for Advanced Medicine. Timothy Vollmer, M.D., Professor of Neurology, University of Colorado Denver, School of Medicine, is Co-Director of the Rocky Mountain MS Center at Anschutz Medical Campus and Medical Director of the Rocky Mountain MS Center. Widely recognized as one of the world’s leading experts in multiple sclerosis, Dr. Vollmer brings 26 remarkable years of experience to the Rocky Mountain MS Center. In addition to serving as Medical Director, Dr. Vollmer has also joined the faculty of the University of Colorado School Denver of Medicine. He built BNI’s MS Program to include a large clinic, an active lab investigating antigen-based therapies, a vibrant clinical research program, and an international registry collecting data on over 32,000 patients. Under his leadership, the Institute’s MS Program was honored as a Center of Excellence by the Consortium of MS Centers. Dr. Vollmer received his doctorate of medicine from Stanford University School of Medicine and is a former faculty member of Yale School of Medicine.